Mini Velo Gios: It’s mine! So a few people have asked what exactly is my souvenir bike from Japan, and here it is: a Gios Feluca mini velo. Mini velo can be any bike with small wheels (and they are frequently folding bikes), but the market in Japan has taken the small wheel platform and added a twist. Some mini velo have taken on the style, components, and sometimes the capabilities of 700C road bikes. Well-known North American and European brands have jumped onto the trend but only offer their mini velo to the Asian markets (Japan, Taiwan, South Korea). his picture was the end of my test ride. I bought the bike from Loro in central Tokyo. Though I would appear to be addicted to celeste bikes, I decided that I liked the sportiness of the Gios mini velo more than the retro style of the Bianchi models. The top of the line mini from Gios is the Panto, which comes equipped with Tiagra and a carbon fork. Unfortunately, no one in Tokyo had a 48cm Panto, so I got the last Feluca in that size. 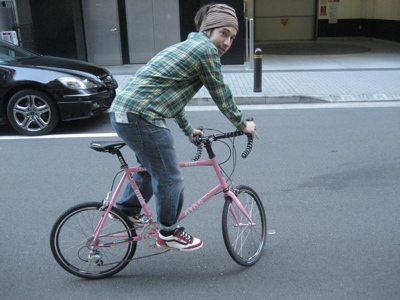 And the bike is pink. 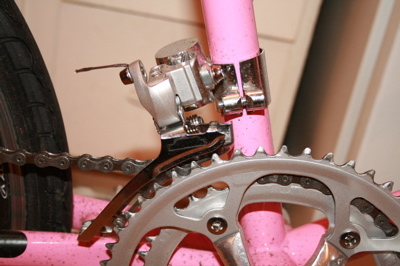 The Feluca has a steel fork and Sora components. I’ll learn to live with the weight of the steel fork, but I cannot abide the Sora components. History has shown I will upgrade components with little justification, and I’m currently working an angle to acquire SRAM Rival. Is the bike small as it looks? Oh, yeah…. but remember I ride a 48-49cm anyways. 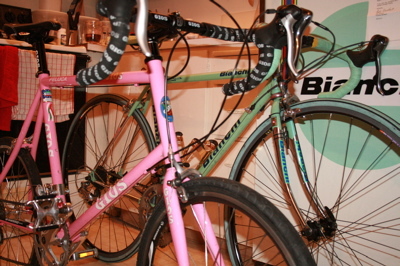 As an Asian market item, Gios mini velo only come in a 48 and 51, and Bianchi just added a third size, 55cm. The top tube is about the same as my 700C Bianchi EL/OS, but the Feluca seat tube is 70deg vs 74.5 of the EL/OS (typical for a 700C 49cm). However I can still duplicate my position on the Gios, more or less. The oddest thing about the bike, beyond the 20×1-1/8” rims, is the funky front derailleur adapter. Anyone want to guess why it’s there? Hint: it’s related to the 20” wheels. Masi’s Tim Jackson probably knows, since Masi is also introducing a mini in 2009 for Japan. Keep checking back for performance reviews and component upgrade projects. Previous Previous post: Let’s get Racing!